If you're looking for an over the top breakfast treat or dessert, then you've come to the right place! 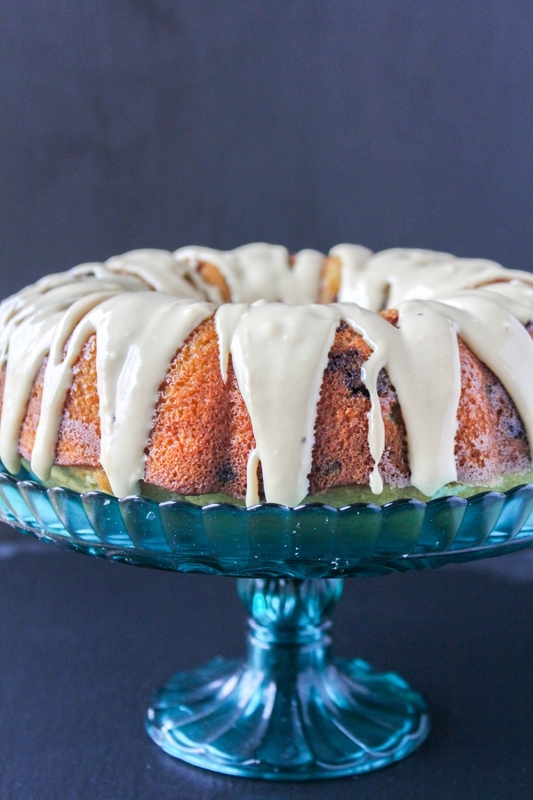 This Chocolate Chip Coffee Cake with Coffee Cream Cheese Glaze is decadent and delicious and equally as beautiful. If you follow me on social media, you may have seen my pics and InstaStories a few weeks ago about a meal kit challenge I received from Milk Means More. You see, they sent me a box of surprise ingredients and in true "Chopped" fashion, I had to come up with a couple of dessert recipes using those ingredients. I was sent eight ingredients that were split into two groups, one group for each recipe. My first challenge was to use cream cheese, chocolate chips, instant coffee and maple extract. After playing around in the kitchen a little bit, I decided to make a coffee cake. Not just any coffee cake though. 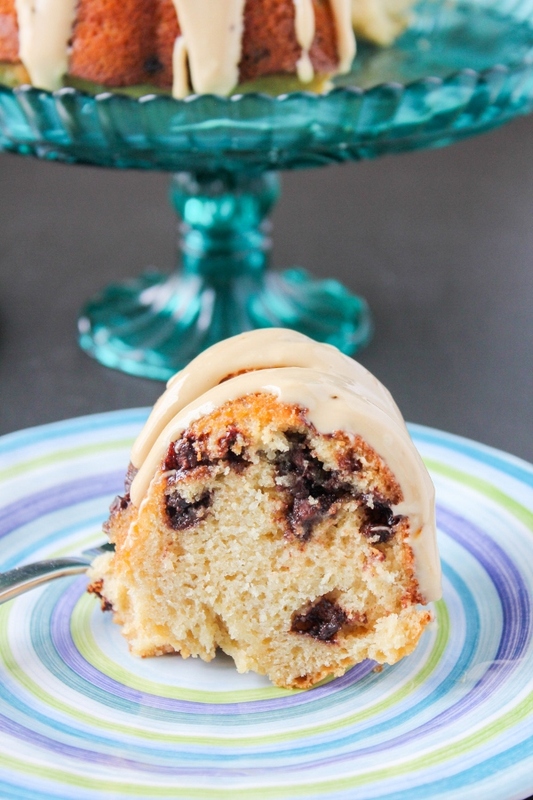 This coffee cake has a hint of maple for extra flavor and is loaded with chocolate chips. 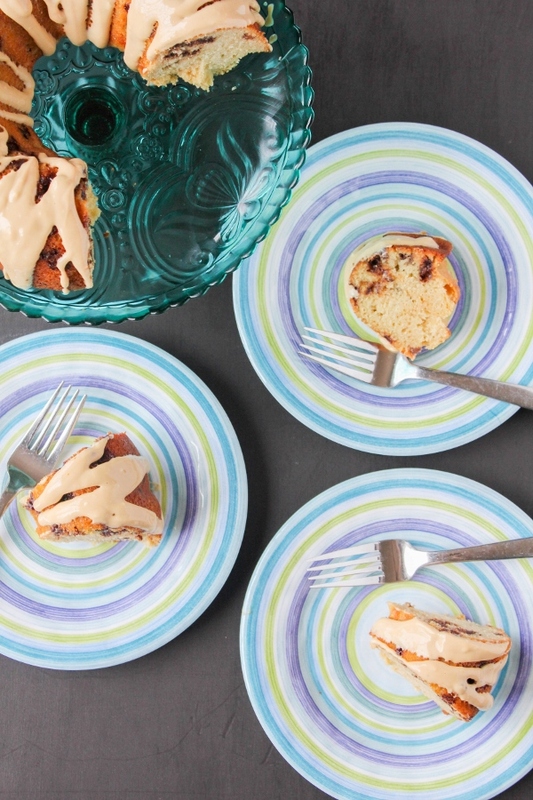 To take this cake to the next level, a coffee cream cheese glaze is generously drizzled over the top. Did that get your attention? 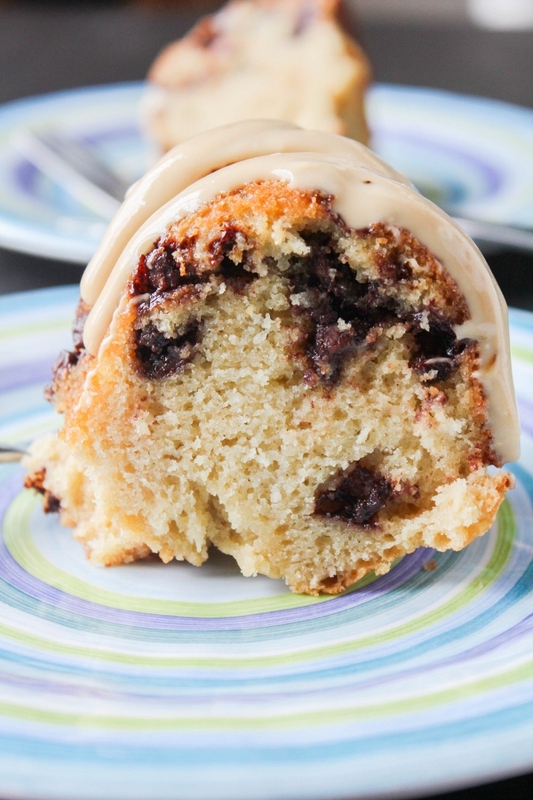 This coffee cake is so moist and tender and full of flavor. The instant coffee adds the perfect punch to the cream cheese glaze, which gives it just another layer of flavor. A slice of this cake is perfect for breakfast with a cup of coffee, and equally as impressive for dessert. Be sure to check back later this week when I share my second meal kit challenge recipe that includes butter, caramel syrup, cinnamon sticks, and kidney beans. Yes, you read that right, kidney beans. Trust me, you don't want to miss this delicious dessert! Preheat the oven to 350 degrees. Spray the inside of a Bundt pan with non-stick cooking spray. In the bowl of a stand mixer, beat the butter and sugar until light and fluffy. Add the eggs, one at a time, beating well after each addition. Add the maple and vanilla extracts. In a small bowl, whisk together the flour, baking powder, and salt. With the mixer on low, alternately add the dry ingredients and the milk, a little at a time, just until blended. Scrape down the sides of the bowl if needed. Add the chocolate chips. Pour the batter evenly into the prepared pan. Bake the coffee cake for 50 - 60 minutes, or until a cake tester inserted into the center of the cake comes out clean. Cool in the pan on a wire rack for 20 minutes, then remove the cake from the pan and allow it to cool completely on the wire rack. To make the glaze, beat the cream cheese with a hand mixer or stand mixer until creamy. Beat in the powdered sugar and coffee granules. Add the vanilla and milk and beat until smooth. If needed, add additional milk one teaspoon at a time until the desired consistency is reached. Allow the glaze to set for a few minutes before slicing and serving.